How ridiculous would it be to travel to Seattle to look at public libraries? 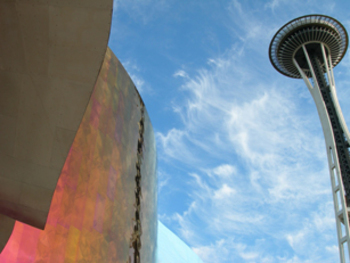 Well I guess to most it would be the call of the wild salmon runs or something similar that would bring them to Seattle, but I just could not help but harbor a burning desire to take in first hand all the Modern Architecture I could find in Seattle in the shortest amount of time. Thus began what I call the “Great Library Run of ’06”. Once properly ensconced in a superb small hotel in the Belltown area, we quickly realized this was a great location in which to walk to virtually everything on our agenda. Hotel Ändra was just the right balance of charming and hip and had a great little bistro attached, LOLA , where we ended up fueling our bodies for the long walk more than once. This is a large structure and the design dominates the street, with overhangs that reach out over the sidewalks in an embrace that seemed perfectly fitting with the way the libraries here reach out into their respective communities. I tagged on to a tour group that gave a good overview of the structure by a dedicated Docent: It became immediately apparent that this building met with some considerable local conflict and budget problems and local pride. Largely privately underwritten, this is the sort of structure that is not likely to be built in Phoenix. I cant’ imagine a civic atmosphere that would privately support a public building outside of a sports arena, Orpheum Theatre not withstanding. What’s remarkable to me about this design is how it disappears in use; something that I think makes it successful. It is LARGE but very well used, full, even on a Tuesday morning. The light was well suited to the Seattle climate and one quickly adapted the volume of space. Sadly, safety concerns disposed of the more intimate nooks and crannies that I find comforting and human in a Public Library, but this structure offered uses far beyond what we typically see in our Libraries. This is a signature building; its design makes a statement. Its mass and scale are perfectly suited to its bustling civic and business location, surrounded by many older buildings that can hold down its mass. Anywhere else, it would be an Imposing monolith, as it was; I was unable to take in the complete elevation. As interesting as it is, I found two other Libraries much more human-scaled, interesting intimate and enjoyable. James Cutler is an architect whose work I highly admire, so I had to search out the Capitol Hill Library .Here’s a work that’s as quiet and unassuming as the Koolhas design is bold. Ensconced in an older residential setting, it was designed with a very tight budget constraint. This building could easily be overlooked, covered as it was is a grid that will allow a network of vines to encase the tumbled brick and trowel finished exterior. This design quietly reflected the local environment and respected its location. A much smaller Library, it is again well used and brings a community together to a center gathering spot. The light was soft and delightful and the detailing no less special for the budget. Now if you like music and guitars, this is a spot you need to plan some time for. They house a wonderful little collection of all the significant guitars that evolved into the modern electric, some great video and photos, plus a hands-on center where you can actually play, mix and record. All this and the Hendrix display to boot. I am now experienced! Debbie had to drag me out, displaying extreme patience with me offering guitar-tolerance that I love her for. Taking a drive to out to nearby Ballard capped the Library search. The Ballard Branch designed by Bohlin Cywinski Jackson is green as green can be, with a plethora of energy saving designs and details incorporated into the building, including a sod and grass covered roof. Read this link for the details. It offers an abundance of small surprises that seem completely appropriate given the nature of the users: a good many were children, completely enjoying themselves in this unique space, all taking a turn to view the hidden periscope view of the grass covered roof. I love the civic pride these buildings represent: everyone knows they are enjoying something unique, even if the don’t quite know why. Remarkably, this branch also spilled out into the public elements of the surrounding space as if to say: We the people of Seattle, care about this place too”. This branch was recently completed and won a much deserved AIA award. I only regret that we did not have more time to explore Ballard, as we saw lot of interesting shops, galleries and restaurants that we did not have time to explore: maybe next time. Several other building stood out, Steven Holls’ beautiful Chapel of St. Ignatius at Seattle University is beautiful, spiritual and serene: check out the movie posted here. Offering a scale that humbles and softness to the interior that marries modern design with the spiritual, it is as good as it comes and well worth the quite time spent there. If you know me you know the penchant I have for coffee and books. Seattle was no less for either. I recommend top-pot doughnuts for both a superb cup of coffee, but damn fine doughnuts and as much walking as we did, I could justify three visits! What’s more, the building in Belltown was as interesting as some of what we can here to see. Fellow architecture Junkies must go and visit Peter at Peter Miller Architecture and design books. A delightful man, he offered a great selection of architecture books and select design items, plus a generous nature that took time to discuss local eats, architecture and all things interesting. If you are sincere and humble, he might offer you a handout on local architecture worth its weight in the books you will no doubt take home with you! Here’s something that I have to reflect on. Seattleites seemed to bring cars to work with them downtown just like we do. As evidenced by a fair amount of parking structures. But I am certain that the City Codes must not fixate on available parking as we love to do in Phoenix. Every street has some available parallel parking and there was no apparent requirement for a restaurateur to “park” his table count. In addition Valet parking was not all that common. So why the car fixation for Downtown Phoenix? Are you listening city planners? While Seattle has us beat in library worship and user dedication (Each and every branch was PACKED!) I still feel that we have them beat in unique infill development. In that regard all I saw was interesting and “loft-like” developments but it was still a bit too apartment/condo in design. I think of The Vale and others here and still marvel at what has been created in little-old Arizona.